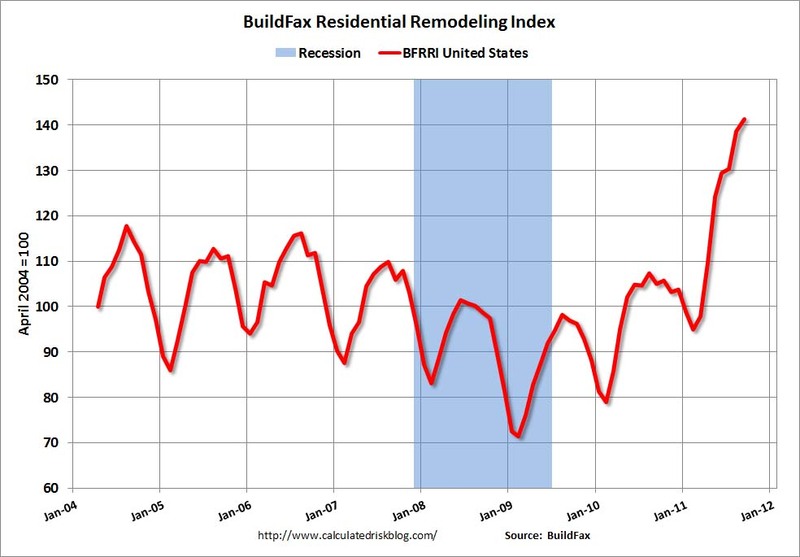 The BuildFax Residential Remodeling Index was at 141.4 in September, up from 138.6 in August. This is based on the number of properties pulling residential construction permits in a given month. 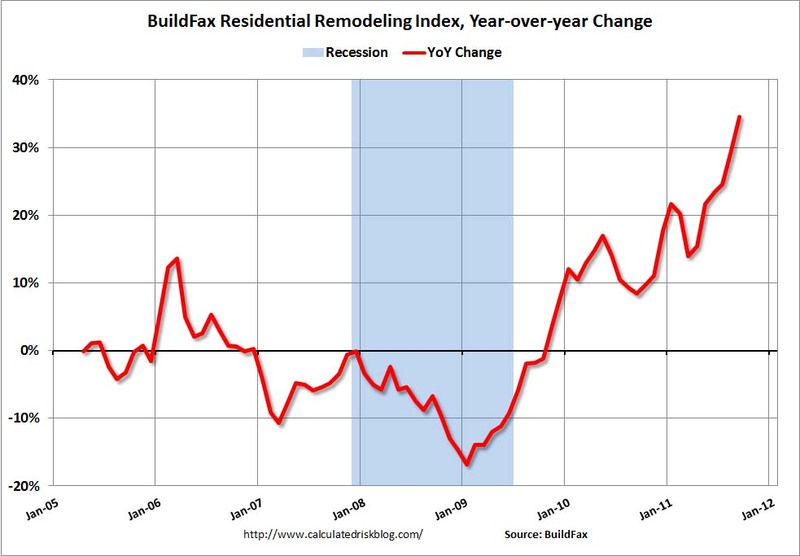 Today, BuildFax®, unveiled its BuildFax Remodeling Index (BFRI) for September 2011, which shows that remodeling activity reached a record high during the month. 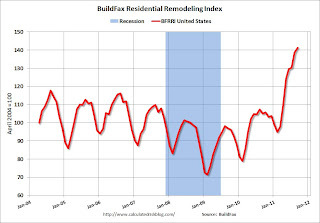 The latest BFRI showed that September 2011 became the month with the highest level of remodeling activity since the Index was introduced in 2004 and represented the 23rd consecutive month of increases. In addition, BuildFax data revealed the most popular permitted residential remodeling jobs since 2006 have been roof remodels/replacements, followed by deck and bathroom remodels. “Mortgage rates continue to be near record lows, and as homeowners from coast to coast refinance, they are continuing to update their current home and invest in their properties,” said Joe Emison, Vice President of Research and Development at BuildFax. “The data from BuildFax show that homeowners are not only doing important ‘maintenance’ projects, such as fixing their roof, but also taking on projects that add to the ‘livability’ of their homes by adding decks, remodeling their bathrooms and updating their kitchens." This is the highest level for the index (started in 2004) - even above the levels from 2004 through 2006 during the home equity ("home ATM") withdrawal boom. Note: Permits are not adjusted by value, so this doesn't mean there is more money being spent, just more permit activity. Also some smaller remodeling projects are done without permits and the index will miss that activity. Since there is a strong seasonal pattern for remodeling, the second graph shows the year-over-year change from the same month of the previous year. 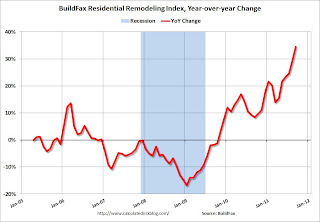 The remodeling index is up 34% from September 2010. This is the highest year-over-year increase in activity since the index started. 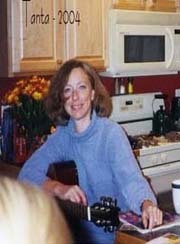 Even though new home construction is still moving sideways, two other components of residential investment will increase in 2011: multi-family construction and home improvement.